With a light rain falling and the Thames flowing below, it’s dramatic enough just walking across the Waterloo Bridge on the way to the National Theatre. To the right of travelers on the Omaha Community Playhouse tour looms a huge wheel, the London Eye that takes 35 minutes for one revolution. The great dome of St. Paul’s appears and Westminster Bridge marks the spot where Big Ben tolls the time beside the Houses of Parliament, not far from the famouse Abbey. But such sites are being visited during four free days. Evening draws near and the 50-plus group, mainly from metro Omaha, Lincoln and other Nebraska locales, heads to the National for their third night of theater. We’ll see Oliver Goldsmith’s She Stoops to Conquer in the Olivier, the largest of three venues. But first slim Rebecca will guide us through the vast complex that eventually grew from its mid-19th century roots to this modern wonder, where six productions run at any time, one waiting in the wings while another commands each of the three stages. She takes us to the top row of the Olivier and describes the acoustics that would allow us to hear a match struck on the stage far below. Just then a stagehand walks across the open set and his very audible footsteps prove her point. And a test of the sound system has Rebecca complaining, “I hate this time of day,” as a horse whinnies, a cow moos and a dog barks for the sound check. From the Olivier with its 1,160 seats, each row much higher than the one below so you could see well even behind an NBA giant, she took us to the smaller Lyttelton auditorium where Travelling Light alternates with Sean O’Casey’s Juno and the Paycock and then to the Cottesloe, a black box where Collaborators about Joe Stalin was sold out for February and into March. But the back stage surprises were best. Round a corner and you see two 10-foot portraits of Sir Laurence Olivier himself, one as a dark-haired leading man, another as the gray-haired elder in charge of the theaters. We learn how each venue has its own technical team, how massive equipment allows an entire set to be lowered and another rise. And we come across Alice, who seems abandoned on a back-stage byway. 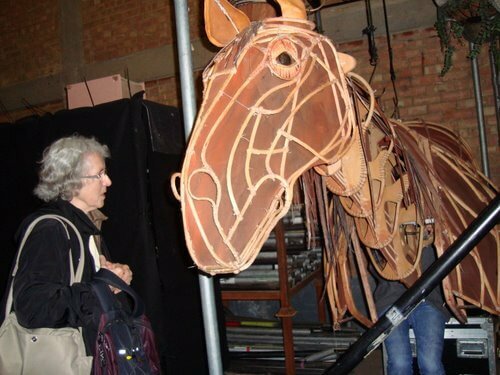 She’s the mother of the heroic steed in War Horse. This creation of wood and leather wasn’t used in the production, but she survives and Rebecca crawls inside to bring her to life. Her noble head soon nods toward Lois Berner and the Omahan just naturally reaches out to pet the mare. Rebecca points out that 24 percent of the National’s income in 2011 came from War Horse, which moved on to London’s West End, to Broadway and film. For perspective, note that it took 22 other plays to earn the remaining 76 percent. We saw more on the tour, but it was only one part of one evening in London. The shows began with the biggest hit, the Benny Hill humor of One Man, Two Guvnors, which started at the National before moving to the Adelphi, an even larger auditorium. James Corden kept the crowd laughing with help from a decrepit waiter and stooges drawn from the audience. A long queue hoping for tickets to the sold-out show made it easy for one of our Nebraskans to get full price for her extra ticket. For many of the tourists, however, Singin’ in the Rain at the Palace was the favorite, with the leading man splashing the front rows with its abundant rainfall. After the musical, we mobbed up on the plaza, and someone noticed another sort of shower. A man with his back to us was pressed into a concave structure that was identified as a public urinal. One of our tourists declared it “European,” which sounds a lot like what he was doing. The crowds outside theaters and on the Underground seemed greater than in my past visits to London, but that might mean we weren’t out on the town so much in the past. Part of the fun comes from following our fearless leaders, Playhouse board members Jim Eisenhardt and Karla Ewert or tour host Audrey Hulsey of Pegasus travel, along bustling sidewalks or into Underground stations. We’d spread along the tube tracks and “mind the gap” while leaping aboard the subterranean trains. This was the 10th Playhouse tour led by Audrey and Pat Leuschen has gone each time. She was joined by her sister, Alice West of Ashland, her daughter Susan and grandson Nick, 17. He wasn’t the youngest of a group dominated by retirees. Rowan Poovey, 11, of Shawnee, Kansas, traveled with her grandparents, the Schirbers from Papillion. –The DaVinci at the British Museum, the Victoria and Albert Museum with Cecil Beaton’s photo exhibit for the Queen’s diamond anniversary, the war room at the Winston Churchill Museum. –“The underwear at Mark and Spencer.” What? And so it went, highlight after highlight. Someone mentioned the comforts of the Phoenix Hotel and its handy location. Nick, 17, named “The Dr. Who Experience” and Rowan, 11, liked the Muggle Museum on the Harry Potter tour. Bob Wicklund from Bellevue ran across the Salvation Army brass and drums. The Franckes found their way on Sunday morning to services at the Chapel Royal of St. Peter ad Vinicula (in chains) inside the Tower of London. A Beefeater waved us past the crowd waiting for the later public opening and directed us to turn past the second arch, walk past the huge ravens and wait for a bell to signal entry. Most of us left early Monday morning for Dublin with time to wander to Trinity College, dating to the 1500s, and to see the statue of James Joyce and Oliver St. John Gogarty outside Gogarty’s pub. On Tuesday, we toured the Irish countryside with Terry Flynn, well-known to Omahans who’ve toured Ireland with the Bob Reilly family. Some bought sweaters, shawls and scarves at the Avoca woolen mill (founded 1723), near the town where public television’s Ballykissangel was filmed. We were greeted by the mayor of Naas (pronounced Nace) in a ceremony at the Kildare County building which marked another 10th anniversary—this one of a decade as Omaha’s sister city. We gathered one more time for a glass of Guinness at the Buskers pub in the Temple Bar Hotel, and then packed up to head home in the morning.